Belle On Trend: Fun Graphic Tees! 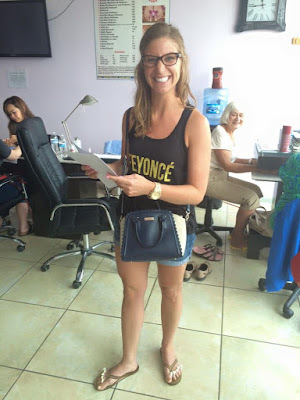 I LOVED this Feyonce shirt, and I wore it on the first day of my bachelorette weekend and the day before my wedding for nails/lunch and picking up my dress from The Crystal Bride. It is a perfect gift for a bride to be. I have actually since passed it along to my bff, Megan! 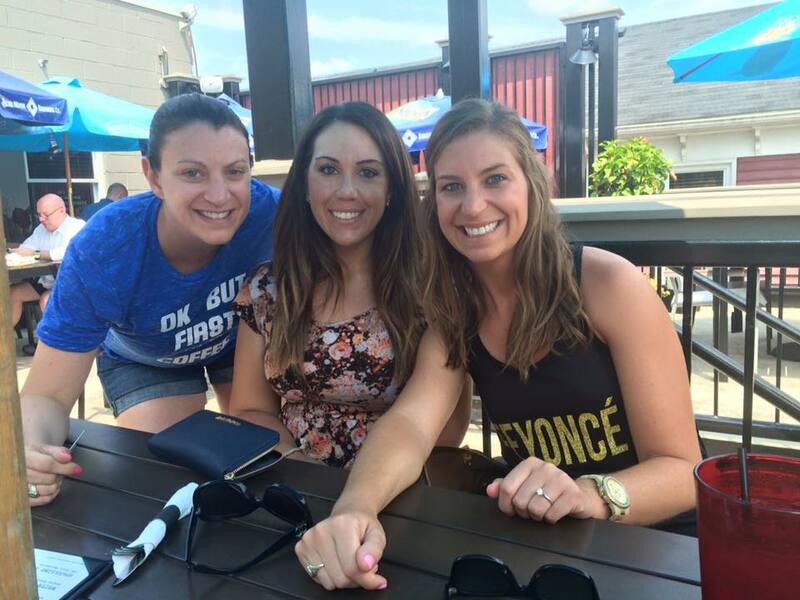 The day before our wedding, out to lunch after nails with my sister (left) and cousin (right). (Side note: I miss that long hair! Time to start growing it out again-- haha!). Anna has on another graphic tee that I love-- more on that below! This was the first day of my bachelorette party, before we left for Lake Geneva, Wisconsin. Love this pic of my girls! Kelly, Mandy, Jamie, myself, Megan and Caitlin. This is a new shirt (above) that I absolutely love. I bought it back home at Ivory and Birch in Boardman, Ohio. Ivory and Birch is THE CUTEST boutique! They have everything from fun greeting cards to glam Trina Turk dresses. This latitude and longitude tee has the coordinates of Youngstown, Ohio, my hometown. It is one of the softest tees I've ever owned! Bonus pics- LOL! I stopped in Indianapolis on my way to Newport, Kentucky last weekend. I got to see my bestie, Fran, and meet her new son, Henry! HE. WAS. AMAZING! Check out those adorable thighs! I couldn't stop hugging him. I'm in love! This tank is one of my faves, too! Thanks to my girl, Taryn, I am now the proud owner of a Treat Yo'self tank! We wore them to Pure Barre last week to earn our "twinning" bingo space for PB Bingo! She found these for us at Target. Olivia kicked our BUTTS in class, but I was seriously so happy to be wearing these tanks that class flew by! We earned another sticker that day for a before and after pic! Haha! You might not be able to tell because Taryn looks so pretty, but that was one of the hardest classes I've ever taken at Pure Barre Geneva! Olivia rocks! This shirt is what you saw my sister, Anna, wearing above. She bought it for us both, actually! So sweet of her. It's from my all-time favorite coffee shop, Graham's 318. If you have the chance to hit up Grahams 318 in Geneva, you won't be disappointed! Be sure to try the "chai-cofskee" because it's the most amazing drink I've ever had-- shout out to Mandy for telling me about it! OMG! This last one is from Everfitte, which is the cutest online retailer for printed tanks (a lot of them are workout-inspired, too!). My friend, Rachel, found this one for me, and I had to have it! Barre Belle! Here are some additional fun ones from Express and Nordies. Author's note: some of these are alcohol-related, so my under 21 gals would have to pass on those-- haha! Sorry! 1. This casual Friday tee would look adorable with the pictured blush blazer. 2. I have this "Bloggers Gonna Blog" tee (and a matching mug from my bestie, Megan!). 3. Loving this tee, as I'm always overdressed for every occasion. Haha! 4. I have had my eye on this for months! My sis would LOVE this one! I love it tucked in with the high-waisted sequined shirt and paired with a fabulous statement necklace. 5. And this because every day should be a taco Tuesday! What's your fave graphic tee?